I was asked this question by a farmer with a bit of a twinkle in his eye. 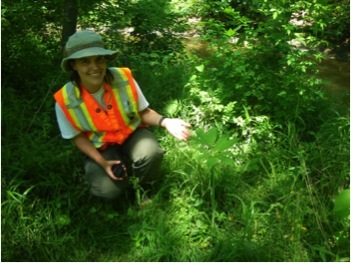 I had stopped at his farm to ask whether we could do a plant survey in his woodlot – I’m searching southern Ontario’s privately-owned woodlands for some of Canada’s rarest plants. Many landowners I meet want to know what’s so special about rare plants. What would happen if this plant did go extinct from Canada? What interactions does it have with other species in the forest, and ultimately, with us? The answers are not so simple. Some of our endangered plants have medicinal uses. 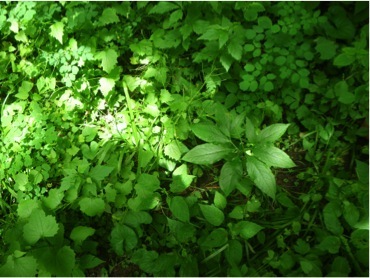 For example, over-harvesting of wild ginseng and goldenseal for the herbal medicine market is part of the reason they are now so rare in Canada. Other plants, such as chestnut and butternut trees, support whole suites of insects, birds and mammals that live in, or feed on, them and their fruits. 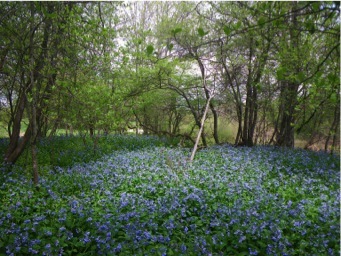 Some rare plants are loved for their beauty – like the carpets of stunning Virginia bluebells that pop up in the early spring. Virginia bluebells (Mertensia virginica) carpet the forest floor of an Ontario woodlot in mid-May. But at the end of the day, for many of our rare plants, we don’t really know what the consequences of extinction would be for the ecosystem, or for us. In some cases, we likely wouldn’t even notice the effect. If spotted wintergreen, with only five known populations remaining in Canada, were to go extinct from our country tomorrow, chances are that our everyday lives would proceed as before. So why even worry about these things? What is so special about them? 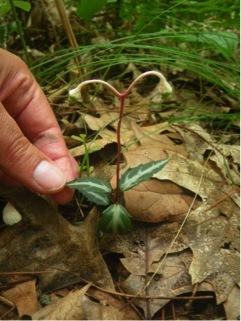 Spotted wintergreen (Chimaphila maculata) is one of Canada’s rarest woodland plants. It is found only in a few forests in southernmost Ontario. I have to admit, I ask myself these questions sometimes as my field crew and I are struggling through thickets of Manitoba maple, trying to pick our way gingerly through huge swaths of stinging wood nettles, and getting scratched and grabbed by prickly roses and raspberries as we search for rare plants. A voice from the past reminded me why I care so much. In 1919, an avid amateur orchid hunter named Herbert M. Denslow wrote an article about his love of orchids. He began his hobby in New York in the early 1900s, a time when Manhattan Island still supported significant populations of orchids. Our human memory is short, and we tend to forget how heavy an impact we have had on the landscape. The forest of southern Ontario is a shadow of its former self. A massive expanse of enormous trees chopped down and tamed to a collection of small fragments in a matter of a few decades after European settlement. The little islands of forest we have left in a sea of farm fields and suburbs are forever changed – fenced, grazed, criss-crossed by trails, and colonized by native and exotic plants that love this kind of disturbance. And yet – somehow – some of the rarest plants hang on. How do they do it? Why are they growing here, and not over there, where it seems perfectly suitable? Are they limited by lack of seed dispersal? Are they on their way out, or just quietly maintaining small populations as they have done for millennia? It’s the mystery of these species, along with their oddities, that makes me admire them. They are not daffodils or tomatoes, nurtured and cared for by us. They don’t follow our rules. They are wild creatures. That alone is reason enough to try and understand what limits them, to try and help them survive despite our dominance of the forest. The author with a green dragon plant (Arisaema dracontium) – a rarer relative of jack-in-the-pulpit. A green dragon camouflaged among garlic mustard, enchanter’s nightshade, meadow-rue and white avens. 1Herbert M. Denslow. 1919. Reminiscences of orchid-hunting. Torreya 19(8): 152-156.